This is our used Auto-Sleeper Broadway EL Duo 2012/12 Plate. 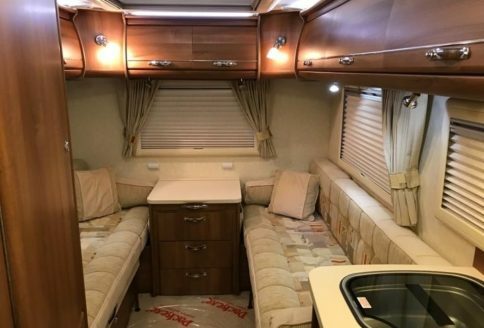 It is a 1 owner Broadway supplied and serviced by us from new and in lovely condition, inside and out. 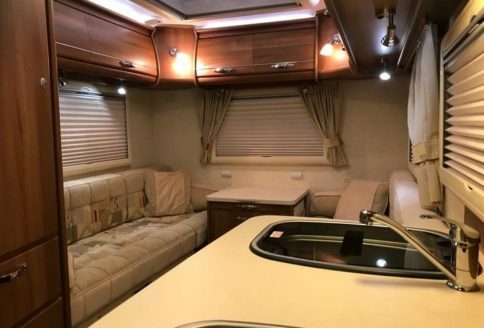 The Broadway EL Duo has an end-lounge layout and is low-profile, thus it’s a 2-berth motorhome with plenty of space to relax in a lovely, light lounge. The kitchen is at the front behind the cab passenger seat and opposite this is the shower room and loo. The toilet is an electric flush cassette and the shower is a “swing-wall” style allowing for a fully enclosed shower. 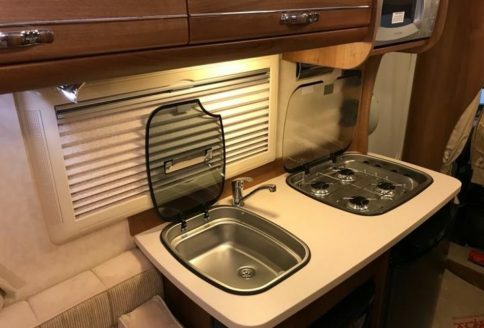 There is a mirrored cabinet built in to the sink unit. The kitchen consists of a 4-burner gas hob and below, an oven and grill combination with microwave oven above the work surface. There is also a sink with hot and cold water and ample work top space for preparation and overhead lockers for storage. The lounge consists of long, comfortable, twin sofas with a useful drawer unit between them which also converts into a quick and simple table top when required. 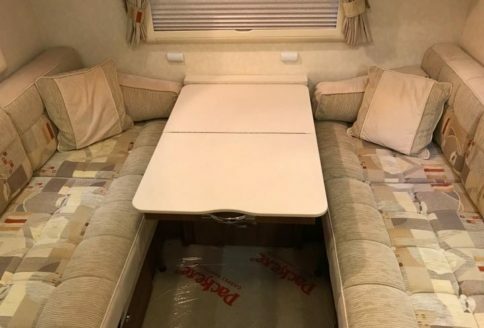 The sofas pull-out to quickly become either 2 single beds or a double. Fabrics are lovely Belgian fabrics chosen for their luxurious feel and long-lasting nature. Additional storage is found underneath the sofas, in the drawer unit and ample over-head lockers in the lounge and kitchen space. 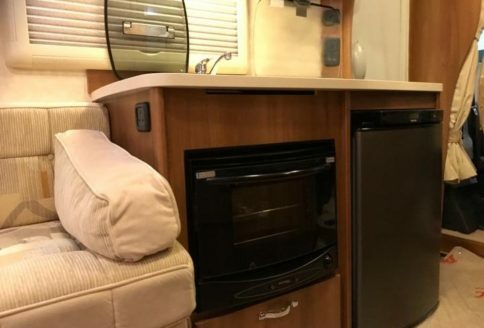 The Broadway has a good-sized wardrobe which also houses a free-standing table, ideal for use inside or out and an additional, small pedestal table too which mounts between the swivelling cab seats. Outside the Broadway has alloy wheels, central locking, a flush fitting wind-out awning and 2-bike cycle rack. On the roof is a solar panel and TV aerial. Finally, for the driver, our Broadway has Peugeot’s powerful 2.2 turbo diesel with 6 speed gearbox, cruise control, electric windows, electric mirrors, adjustable steering column, colour reversing camera, a radio/CD player and cab air conditioning. 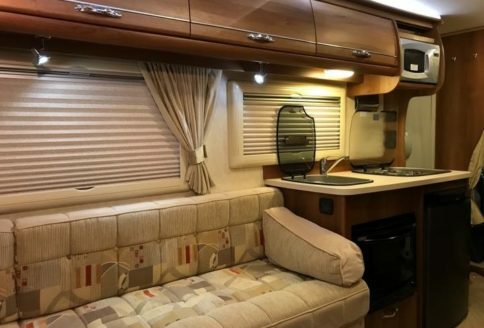 Copyright : © 2010-2018 Derby Motorhomes. 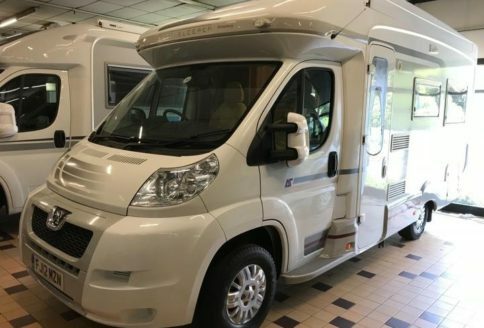 Derby Motorhomes is a trading name of Motor Plus Derby Limited. Registered offices : Chapel Street, Derby, DE1 3GU. Company Registration Number : 3473314. VAT Number : 705 7429 33.